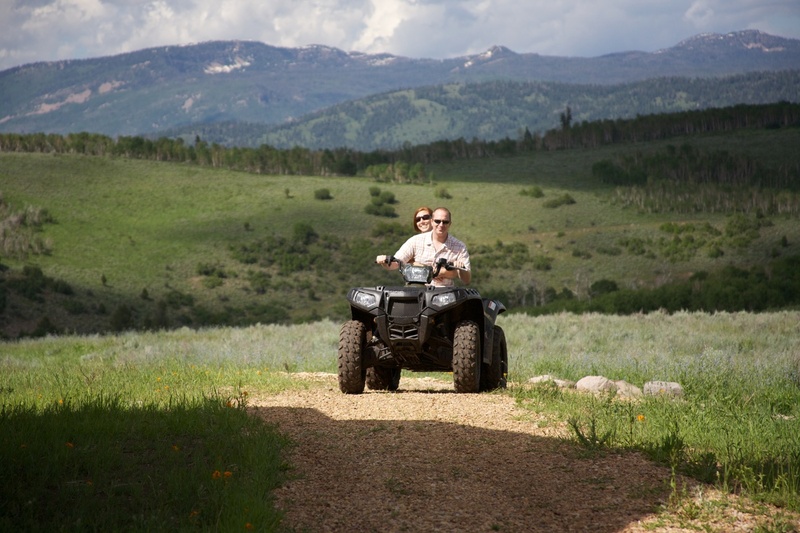 60 Miles of maintained trails in Summer and Fall and 30 miles of groomed trails in the Winter and Spring are the venue for the most popular of the Ranch outdoor pursuits. 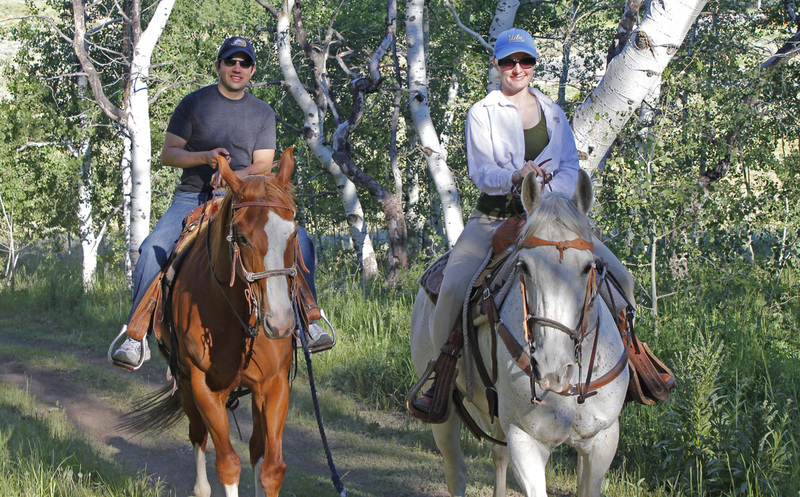 Horseback riding on the Ranch’s many trails is amazing. The scenery and wildlife are among the best one will find anywhere. Trails have been built and maintained with safety in mind. There are plenty of trails that are kid friendly and navigating is generally straightforward. For the more adventurous rider, there are many game trails and National Forest trails that can take you to extraordinary natural places. Most trails are designed for side by side style ATV’s. 4 wheel drive is occasionally necessary to help prevent erosion, but most trails ride easily and safely with 2 wheel drive. There are a few trails that will only accommodate single rider style ATV’s on certain sections as they have narrow sections going through rocks or other natural features. Electric ATV’s are becoming a popular option, especially for those interested in wildlife photography as they can approach elk, mule deer and moose with horse-like stealth. Snowmobiles are a very popular Winter and Spring activity. The 30 miles of groomed trails pass through some extraordinary scenery and settings and allow access to all of the yurts, which serve as warming huts during the winter. The Uinta National Forest features hundred of miles of maintained trails and extraordinary opportunities for off-trail snowmobiling in Utah’s legendary light and dry powder snow. The Forest trails extend all the way into Wyoming. Snowmobiles are also used to access backcountry snow skiing and boarding. Both on trail and off trail opportunities are endless on the Ranch. Night time snowshoeing is particularly popular as clear nights on the Ranch are spectacular with the Milky Way and the occasional Aurora Borealis visible. On and off trail cross country skiing are popular on the Ranch. The Nordic track located near Ranch Center is groomed regularly and is designated only for cross country skiing. 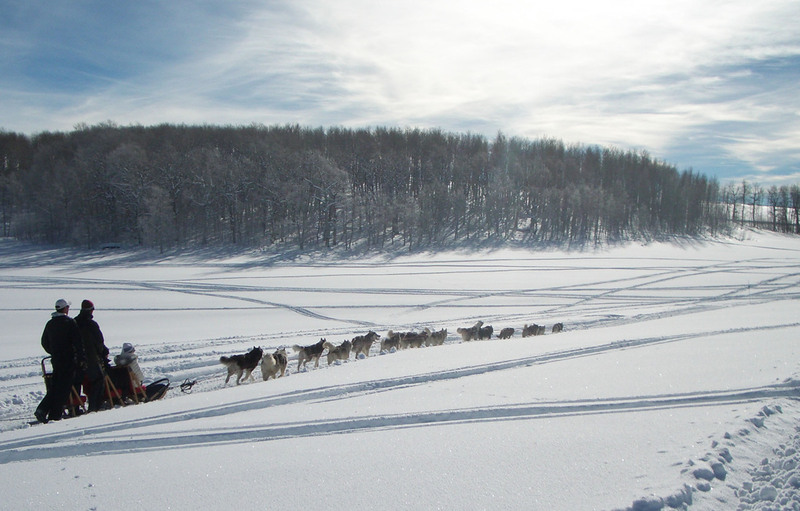 Several local dog sled companies offer services for Ranch owners. The 60 miles of trails on the Ranch offer excellent opportunities to see the aspen and evergreen forests up close and personal. The trail system is excellent for mountain biking with trails that are mostly easy to intermediate. Road cycling is increasing in popularity on the Ranch’s 27 miles of paved roads….with almost no cars! The Tour of Utah cycling race, America’s toughest stage race, makes the Ranch a regular stop. Teams that race in the Tour de France and past winners of the Tour de France make this rapidly growing race quite an event. The new Electric Mountain Bikes are also becoming popular on the trails as their 40+ mile range can make for a great alternative to ATV’s. The Ranch features a seven mile border with the Uinta National Forest. The Forest is an incredible place all year, but especially in the winter on snowmobiles and in the Summer when the wildflower fields can be measured in some places in the hundreds of acres. There is an access into the Forest from the Ranch. Forest Service maps are available using the Avenza Maps app available in the app store. We are USFS Region 4. The USFS Motor Vehicle maps are available at no charge.